Yes, there’s even more detail in the photo than the medium resolution version the thumbnail links to – you can read the text on the ends of the cars. However, that version is huge. If you want it, email me. This entry was posted in Historical on March 23, 2015 by ndholmes. Ever since I drew the original plans a year ago, I’d always had the idea that – should the CRNW have survived – that there might be a branch to Katalla. As those familiar with the CRNW know, at one point Katalla was to be the terminus of the CRNW. It had a key advantage for a burgeoning mining industry – nearby coal and oil reserves. The town lacked one key feature, however – a natural deep-water harbor. In reality, Katalla’s demise began with the federal government (under President Teddy Roosevelt) withdrawing public lands from coal mining in 1906. Shortly thereafter, the lands were closed to timber and oil extraction as well. Then, in November 1907, all of the Katalla dock and breakwater facilities were destroyed in a series of early winter storms. With no available resources – save a single 160-acre oil field – and no facilities, the CRNW packed up and moved its terminal to Cordova. Katalla would get a refinery to process the limited (but apparently high quality) crude it produced, but little other industry developed to sustain the town. By 1933, when the refinery accidentally burned, there were reportedly only about 100 people still living in town. However, that was the end – after 1933, Katalla would fade into history. In 1971, however, new hope arose for industry in the Katalla area. Thanks to the Alaska Native Claims Settlement Act and its effort to compensate the Alaska native peoples for their losses, the Bering River bituminous fields and the Carbon Mountain anthracite fields passed to the Chugach Alaska Corporation, one of the regional corporations set up by the ANCSA to administer lands transferred back to the native people. In 1991, the rights to develop the field were sold to the Korean Alaska Development Corporation as part of CAC’s Chapter 11 bankruptcy proceedings. KADCO has yet to do anything with these rights, and in fact several conservation interests have discussed buying them to prevent any future mine. Further, the CAC obtained rights to try for commercially-exploitable quantities of oil and gas in the Katalla Field in 1982. However, these rights were temporary, and expired at the end of 2004 unless a commercial well could be put in production. In reality, no commercially viable oil well materialized, and the coal fields remain untouched since 1906. However, with the idea that my modern day CRNW could provide both a customer and a transportation solution, I’m going to explore the idea that at least the coal fields were developed at a small scale. Local coal seems a plausible energy source for both my processing plant at Eyak, the town of Cordova (which in reality today draws its power from both hydro and a large diesel plant), and the mine operation itself. Plus, having another local job to run adds more operating interest than just the ore trains and wayfreights plying the mainline. As much as I’d like the branch to have been developed in the 1920s or 1930s, I’d have to bend history around too much to make that plausible. If the Guggenheims and JP Morgan couldn’t get the Department of the Interior to change their mind about resource extraction in the 1910-1930 era, there’s no plausible reason to believe that it would have happened between 1930 and the transfer of the coal loads to the CAC in 1972. So, in my version of the world, the Katalla Branch would have been developed in about 1972, once the dust had settled on the ANCSA. One of the original 1913 Alaska Railroad Commission reports indicates that two routes were considered from the CRNW to the Bering coalfields. Both would start near the Miles Glacier Bridge. One route would run around the coastline to Katalla and then back up the Bering River. The other (shorter) route would run up the Martin River delta, cross over near the foot of the Martin River Glacier, and then pass over some steep grades (estimated at 1.7-2%) and around the western shore of Lake Charlotte. From there, it would reach the mines and could be extended down towards Katalla. By 1972, with modern motive power, construction techniques, and the recently-reinforced knowledge of the powerful damage earthquakes could transform the coastline, I have to assume that the the mountain route via Lake Charlotte would have been used. Plus, there was no reason for the Katalla Branch to actually go to Katalla by that point, as there wasn’t anything left of the town. My other problem is rather pragmatic – I sketched in the Katalla Branch coming off the mainline between Alaganik and the Miles Glacier Bridge. In reality, it would have diverged in this area, coming off the mainline after it had crossed the braided tributaries of the Copper on the north/east side of Long Island. The problem is that’s located at the end of the peninsula on my layout, and I can’t come up with a good way to helix the track down at that point. There’s just too much benchwork needed to support the peninsula to start putting holes in it. I don’t intend trains coming off the branch to ever be particularly long – maybe 8 cars plus engines and caboose, to be roughly in proportion to mainline trains at 20ish cars. Plus, back-of-the-cocktail-napkin calculations show that creating 200 tons of pure copper a day via electrowinning would take roughly 4-5 cars of coal per day, given typical generation efficiencies. So if I could pull 8 cars out every op session, that seems reasonable to feed the whole shebang. Enter the train elevator. Basically a strip of track 55-60 inches in length, mounted to a wood carriage that rides on two linear rails. A pair of stepper motors and jackscrews raise and lower the track between the two decks. I intend to make it 99% automated, so that the train pulls in, power gets cut when it hits a sensor, and the elevator takes it to the other level. From an operator’s point of view, they’ll leave Katalla Junction and disappear into the trees, and a minute or so later pop out of a summit tunnel or cut on the very lowest deck. There’s absolutely nothing like it in the prototype. I know and accept that. I wouldn’t want one on the mainline – the main decks will be connected via a proper helix – but it seems an acceptable way to add time (otherwise the supposedly 38+ mile branch would only be maybe 15 feet long) and an easy connection to what amounts to a long industrial spur. It gives me a plausible connection to local fuel producer, and a reason to run another local job every op session or two. I’ve got the rails, the screws, and the stepper motors – now it’s just a matter of getting all the other widgets (screws, brackets, etc. ), designing some controls, and testing it out. I’ll let you know what comes of it. This entry was posted in Alternate History, Benchwork, Historical, Trackwork on June 13, 2014 by ndholmes. For those of you who think I can’t use a spell checker, I thought I should clarify something. There really are two distinct spellings of “Kennicott” – one with an ‘i’, one with an ‘e’. Kennecott refers to the Kennecott Copper Company or the company town at the base of the mill. The ‘e’ was a misspelling on the incorporation paperwork that has persisted in the company’s name to this day. Honestly, the mine and the town are referred to by both spellings, and it all gets used interchangeably. I try to be at least consistent, but I guarantee a truly pedantic editor will find me abusing that principle at least a few places on this site. This entry was posted in Historical on December 31, 2013 by ndholmes. The Copper River & North Western crossed the Copper River three times on its way from Cordova to the mines at Kennicott – once across the delta on miles and miles of trestles, fill, and the occasional truss bridge, once at the famed “Million Dollar Bridge” near Miles Glacier at milepost 49, and then again northeast of Chitina at milepost 132. Both of the lower crossings were permanent and relatively durable. The miles of temporary trestle were slowly filled with rock where possible, making for a very sturdy embankment between more permanent trestles and spans. The Miles Glacier bridge stands to this very day as a testament to its engineering and construction, although it did need a few million in repair work in the past decade to undo 1964 earthquake damage that dropped the last span into the water. The last crossing, however, was never permanent. The CRNW built the Cordova-Chitina line to a slightly better standard than the Chitina-Kennicott line, because it initially considered the latter segment to be a branch line off of a mainline that had ambitions of reaching further into the heart of Alaska. (That, of course, never happened.) Due to the expense of yet a third large steel bridge on what, at the time, was considered a branch, the MP132 crossing was constructed as a timber trestle with steep approach grades on both sides. Each year the spring break-up of ice (and sometimes due to glacial lake outflow flooding – more than once a year) would take out significant portions of the bridge, and each year, CRNW B&B forces would drag out the pile driver and put it back. What actually happened was that the 1938 trestle (the one that carried the last train on November 11, 1938) washed out in the spring ice break-up of 1939, just as expected. 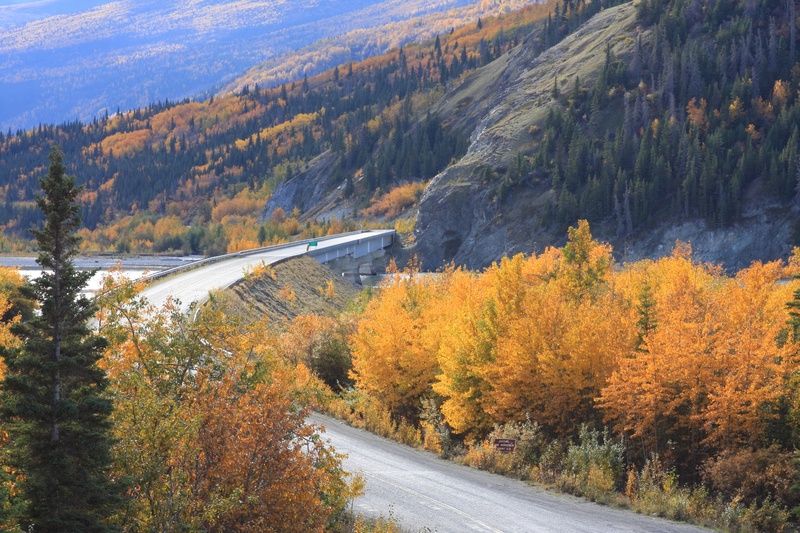 It was replaced by a cable tramway high over the Copper River, which lasted into the 1960s. In 1971, the current deck girder road bridge was completed roughly where the trestle was located, and the grade was turned into a slightly less primitive road. The road was improved again in the 1990s, giving us the state of the McCarthy Road today. Now stepping into the world of the CR&NW that only exists in my mind at the moment, and is turning into reality in my basement… The CRNW has survived into the present day, and is still hauling ore from expanded workings around McCarthy. Clearly some rinky-dink trestle that gets destroyed a couple times a year is not going to have survived this long. The third bridge would have been built at some point in this alternate history – but when? It’s likely that no bridge would have been built during the WWII era due to material shortages. 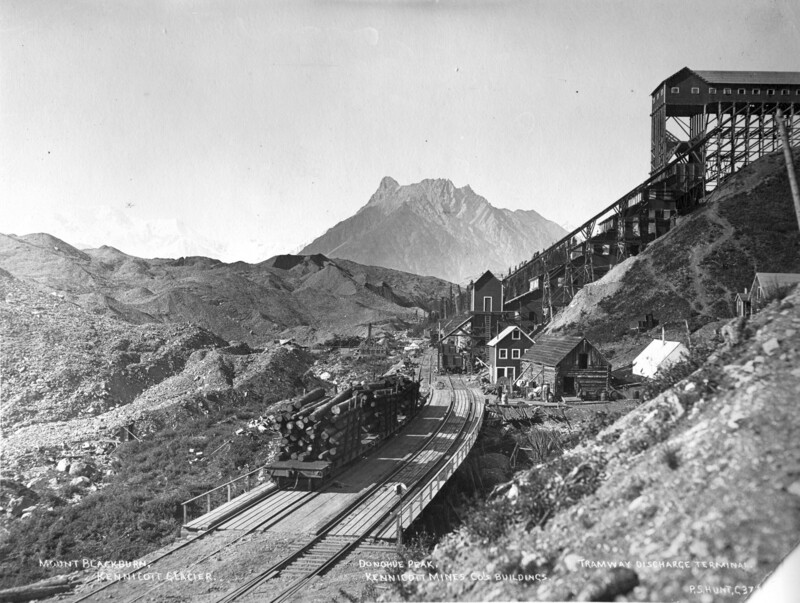 Either it would have been built in the 1930s – not likely because of the low demand for copper due to the Depression and cheaper copper available from other Kennecott properties – or in the late 1940s/early 1950s following the war. Given that Kennecott dieselized (or electrified) many of its steam properties immediately following WWII, it’s reasonable to assume that a surviving CRNW would have followed suit. So, for our alternate CRNW history, we’ll just say that diesels, mine improvements, and track improvements were all part of a large capital project starting around 1951, as the light rail, untreated trestles, and other such would have been in need of renewal and improvements by this point to keep the railroad safe and efficient. Okay, so now we’ve worked out an approximate date that would be likely for construction of the Chitina bridge. Thanks to an engineering diagram that Ron Simpson posted on the myLargescale.com forum (full-size image here) a couple years ago, I know what the original proposed (1909) Chitina steel bridge would have looked like. 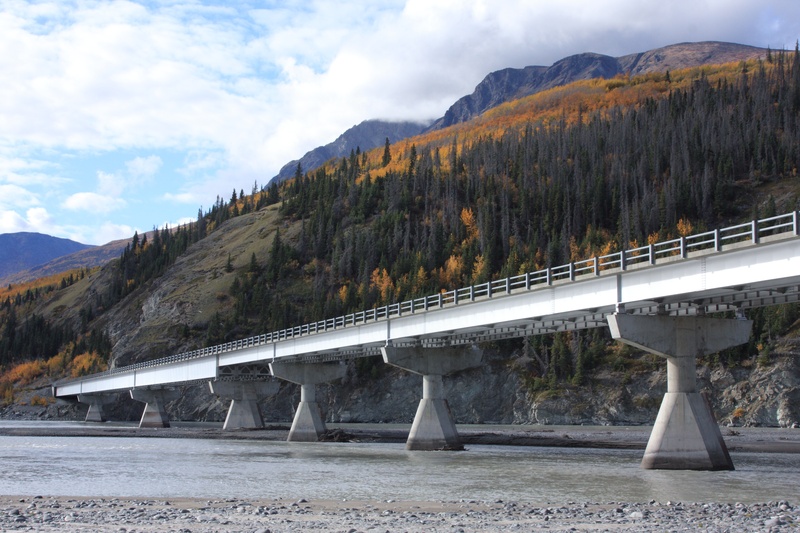 The planned structure would have a 360′ Pennsylvania truss crossing the main channel on the Chitina end, followed by three 275′ deck truss structures similar to those used on the Kuskulana bridge. The railhead would have been approximately 94ft. off the river bottom over the main channel, and 70ft. off ground level on the east end of the bridge. We’ll take this as the baseline. I’m torn on how to model this. On one hand, I know what the planned structure was supposed to be. On the other hand, the railroad lived with the temporary trestle until 1938, and per the reasoning earlier, that temporary structure may well have lived until the very early 1950s. If a 1950 engineer was looking at the same river, would he arrive at the same conclusion as the 1909 engineer who came up with the original structure? Or, instead, would the 1950 engineer look to newer, less time consuming and costly construction styles, such as deck girder? Would that bridge have lasted to present day? Just to throw another complication in there, would the State of Alaska still have built a road out to McCarthy? Okay, okay, let’s start working through those one by one.. 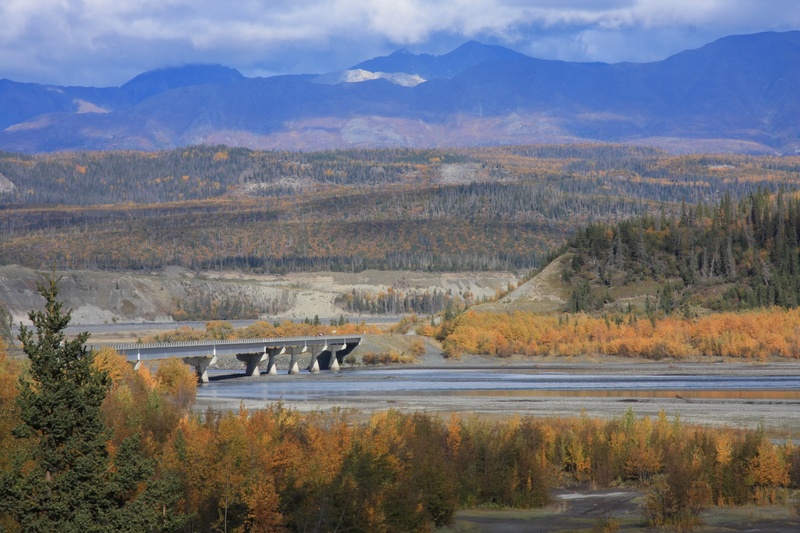 Various bits of data I can find from the USGS and other qualified organizations suggest that the immediate Chitina area has not received any earthquakes violent enough in the last 60 years to have significantly damaged a large, well-constructed bridge like the one proposed. It’s simply been too far from various epicenters of large quakes (1964, 2002, etc.) Given that railroad bridges are typically designed for 100+ year lifespans, there’s no reason that a 1950 bridge should not still be in service today. My current thought is to go forward with the original bridge design, selectively compressed to fit within the 5 feet of allotted space that I have (the real one would have been around 8 feet), but make it a shared road/rail deck . It’ll obviously be one lane, so we’ll add some traffic lights at both ends, and interlock them with the signal system. It does raise the question, however – if the road and railway shared the MP132 bridge, what would they do when crossing the Kuskulana? This entry was posted in Historical, Planning on August 28, 2013 by ndholmes.